Catawese Coach Lines, Inc. of Shamokin, PA offers One Day Bus Tours, Vacation Tours, Charter Service & Group Tour Planning Services. 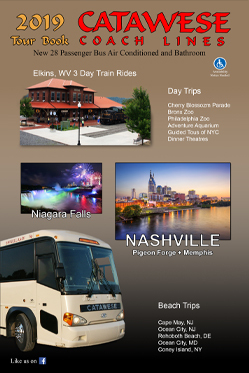 Catawese Coach Lines, Inc. has the experience and resources to help you make the most of your trip. We take pride in running clean, well-maintained coaches. Our friendly, experienced staff will ensure that your trip will run smoothly. Tour Page has been updated with new 2019 trips! We have a handicap bus available. Request is needed!